There’s energy all around us in the form of TV, radio and WiFi signals. Develop a device that doesn’t need much power, and you can harvest enough power from thin air to cut out the need for a battery entirely. University of Washington researchers have found some interesting applications for this like communication between devices and using WiFi to detect motion. Their latest effort powers a gesture recognition device with TV signals, with the added benefit that the device costs less than $1 to make. Known as the AllSee, the device is a tiny quarter-sized sensor that can be paired with existing tech to create a gesture-based user interface. Like using a Leap Motion, you can wave, push or close your hand in the air in front of the AllSee to communicate with a computer, robot or other tech in different ways. The sensor also uses TV signals to monitor for gesture commands. Whenever you move through a space, you alter the signals in the air around you. The sensor tracks how your hand changes TV signals and converts that change to interpret how you moved your hand. AllSee is small enough to easily be attached to the back of a mobile phone. The research team tested eight different gestures with an AllSee-equipped phone and found that the sensor interpreted gestures correctly more than 90 percent of the time. It is able to detect gestures located more than two feet away and even sense through clothing. For example, you could place it in your pocket and it would still work. 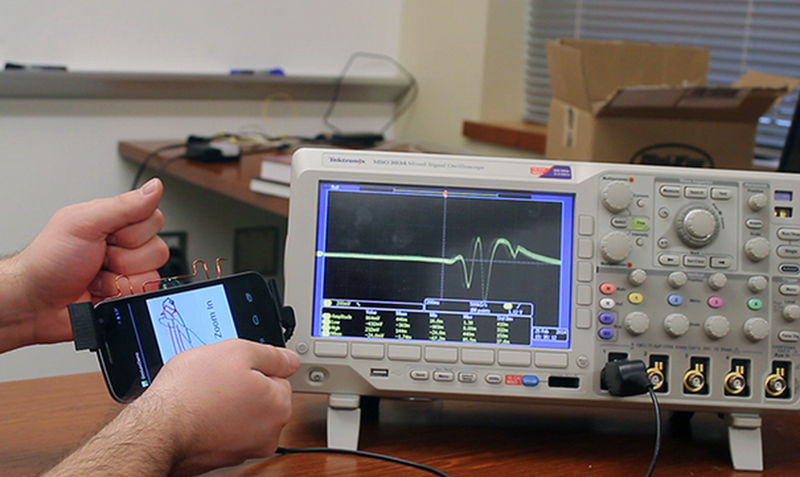 An oscilloscope machine shows the change in signals detected by the AllSee, which is shown here attached to a phone. Photo courtesy of the University of Washington. “Beyond mobile devices, AllSee can enable interaction with internet of things devices. These sensing devices are increasingly smaller electronics that can’t operate with usual keypads, so gesture-based systems are ideal,” UW electrical engineering doctoral student Bryce Kellogg said in a release. The team will showcase their invention in April at the Symposium on Networked Systems Design and Implementation conference in Seattle. If you’ve ever tried to use a thermin, then you kinda know that this isn’t got to really work all that well. An excellent way to interact with smartphones. A buck? Really? If so, why is there no reference to Radio Shack part numbers? Using renewable source of energy, cheap technology and hacking electrical devices at home. Gesture recognition becomes a reality. Reason I say this, is some of the current Television sets that boasts gesture recognition is blown out of proportion and from experience is real annoying to understand or pick up real fast. These guys from the University Of Washington deserves a cigarrrrrrrrrrrrrrrrrrr!